Ever hear of the Khwarezmid Empire? Or the ruler of that empire, Shah Ala ad-Din Muhammad II? No? Here's why: the story goes that around 1218 A.D., soon after the Mongol conquest of the Jin Dynasty capital of Yanjing, a large caravan was sent to the neighboring Khwarezmian city of Ortrar to open a trade route with the ever-burgeoning Mongol kingdom. Instead of receiving them with open arms the governor of Ortrar, Inalchuq, attacked the caravan and plundered it. To this day no one knows for sure why Inalchuq did what he did. Perhaps it was simple avarice? Some believe that Inalchuq suspected the caravan of harboring Mongol spies, but that's highly unlikely given that Genghis Kahn and his generals were embroiled in a lengthy campaign against the Jin Dynasty way on the other side of the map. Nevertheless, the Great Kahn was willing to be magnanimous and sent a diplomatic mission to the ruler of Khwarezm, Shah Ala ad-Din Muhammad II. The Shah promptly showed his contempt for the Mongols by shaving the heads of the emissaries and having them all beheaded. By 1220 A.D., just 2 years later, Inalchuq had been executed by the pouring of molten silver into his ears and eyes and the Shah had died under mysterious circumstances while in hiding on a nearby island. A river was diverted to obliterate the birthplace of the Shah. An empire was erased from the face of the earth because Genghis Kahn, also known as Temujin, wished it so. Reading of the terrifying exploits of the Mongols, of Genghis Kahn in particular, can be both educational and entertaining. It also makes for great cinema. The last major production in the West of a Genghis Kahn biopic was 1965's Genghis Kahn with none other than the great Omar Sharif in the title role. 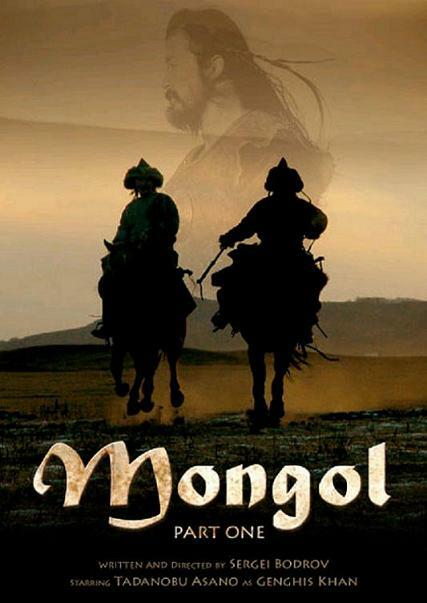 There have been productions since then, especially in the East, but the recent theatrical release of Mongol is a uniquely serious take on the life and conquests of the great unifier of Mongolia. The film is directed by Sergei Bodrov, a relative newcomer to American audiences. His view of Genghis Kahn is less historic than it is mythical. This is not to say that the movie has a disconnect with its audience, rather it serves to reinvent the legend of the brutal and ruthless Kahn into something more of a hero figure. The Great Kahn of Bodrov's vision is one who'd rather forgive his enemies than have them drawn and quartered, a loving husband and doting father, and a noble unifier and law-giver to a disparate nomadic people. Aside from the animism and totemic overtones, much of Bodrov's film is easy to accept and our suspension of disbelief is less an exercise but a mere walk in the park. The film does have its share of problems, particularly in editing, but these mistakes are easy to forgive as the photography captures the fleeting beauty of the barren steppes and the intense brutality of battle. Prepare to be captivated as you take a rare glimpse into the life of one of history's greatest figures.